I've heard that in other countries cycling is only for sport and recreation and involves tight-fitting clothing constructed of man-made fibres and accompanied by excessive amounts of 'gear'. Strictly speaking, one can make tight-fitting clothing from wool. tak for feedback'en på tværs af øresundet, lars. the 'gear' on our bikes is the same as bikes prior to car culture. the same stuff people have always used on bicycles since they were invented. standard issue. bells, for one, are required by law. chainguards and skirtguards are practical and serve a purpose, as do baskets. All bikes are beautiful, as are the riders who ride them! I would like to know which country you are speaking of? I have been to several on this earth of ours and in every one I've seen both types of cyclists. I'd like to visit this 'purist' spandex loving country you speak of. Copenhagen 'gear'- big purse, high healed boots, H&M shopping bag, cell phone, squeaky chain (optional). Much of why cycling in the United States is dominated by sport cycling is a cultural problem. And since culture is composed of ideas, institutions, and practices much will have to happen to change our situation. For one, our roads do not have dedicated bike paths. The massive distances required to travel to the store or to work because of our (sub)urban planning doesn't help either. Only in major cities where mixed transit or self-contained neighborhoods or higher population densities is biking with clothes on an option. We're set up to preclude anything other than motorized transport in many areas. The 10 miles of roads I travel to school have no bike lanes and traffic of upwards of 45mph (72kph). Try riding at a moderate pace in an upright posture there and you'll never make it on time, perhaps never make it at all. I use a rack and have fenders I can put on for wet days. I would like for the structural changes to be made to promote cycling. I would consider moving into a neighborhood that is cycling friendly. But few places are such, and so I must adopt my aero position while wearing lyrca. I wish it were otherwise. Thanks for your blog and for showing other folks that cycling can become a quotidian feature of life like driving a car--but more enjoyable. Please don't scare folks away with digs that could be perceived as self-righteous. The thing about fashion sites is that you really can't take them all too seriously. Fashion can be functional. A leather jacket and jeans (very safe and smart at 25mph) with a toucan bird's beak mask may just be as aero, if not more so, than plastic tights. Also, please don't give up or compromise your sense of humor. It's why I come back. Yeah, us Yanks get the message. We're vain and boorish. Give us a bit of a break, though. 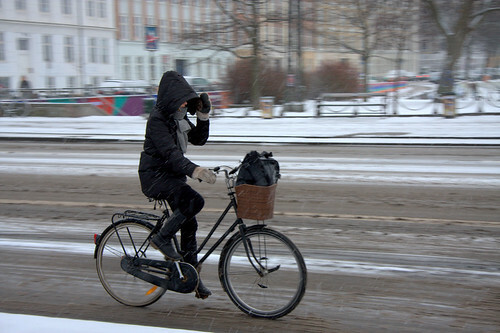 If we had Danish tax rates, we could afford to build some nice bicycle facilities, and if our population density was much higher, it would actually make sense to bicycle more often in cities. Don't get me wrong--I ride to work when I can, and I haven't worn my Lycra stuff in a long time. I even have fenders and bells. But lead and persuade by example, not by making Americans feel like idiots. Some of us are doing the best we can in a situation that will take an immense amount of cash and time to change. And even that will be very gradual. Um... I live in the U.S. I made the ocean and cancer comments above. I realize there's a problem, not just in the U.S., but the world over, and I, just like you, am trying to look for solutions. But to say it'll take a lot of time and energy and be gradual... I'm not going to buy that. I live in a fairly large town (is Los Angeles considered large? ), and bike when I can to the grocery, the farmer's market, and for errands. I'm braving the traffic. Today. We have some bike lanes. Today. It's do-able. If it takes some people here a gallon of gas to buy a gallon of milk, then I'm going to get on my bike and try to balance things out a bit. And if I get lazy, or the weather gets down to a chilly 50 degrees F, I just remember this website.